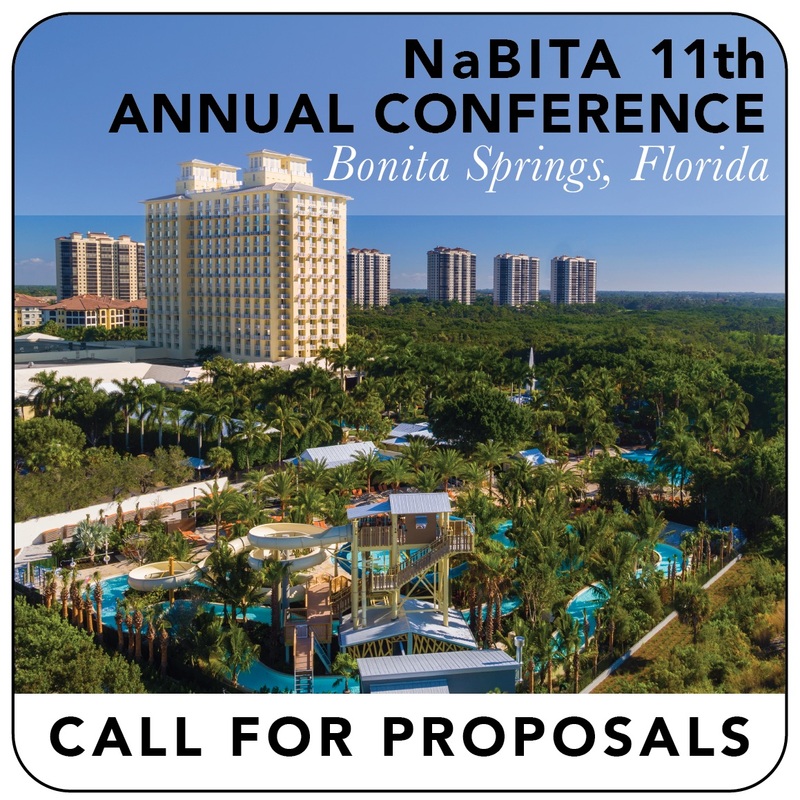 The NaBITA Conference Committee is soliciting program proposals for its 11th Annual Conference, to be held November 11-13, 2019 in Bonita Springs, FL. The Call for Programs closes on July 12th, 2019. If your program is selected, the presentation abstract provided in the application will be included on the conference site and the printed conference program. Please make sure the abstract clearly conveys the objective, theme and style of the presentation. Click here to view the CFP submission scoring rubric. You are encouraged to submit multiple proposals and/or proposals for both a concurrent session and session snapshot. All concurrent session and session snapshot presenters must register and pay for the conference. There are no waived or reduced registration fees for presenters. You do not need to be a NaBITA member to attend, or to present (but we hope you will join!). All presenters selected must be physically present for their sessions (telepresence not permitted). Please note that, in order to provide a variety of topics during each session, NaBITA reserves the right to assign date and time of each presentation session. Changes to the schedule cannot be accommodated. If accepted, presentation materials will be due on or before September 28, 2019. Please remember that the Conference Committee has only your submission on which to evaluate your proposal. Some tips for writing a successful proposal can be found here. By submitting this program proposal, I agree that any presentation materials will be submitted by September 28, 2019 to be made available to attendees in advance of the conference. I agree that NaBITA is entitled to use and distribute these materials to members and conference attendees. All questions should be directed to the Conference Committee via email to conference@nabita.org or by phone at 484-321-3651. * 9. Are any presenters of this session NaBITA Members? * 11. If your proposal is not chosen for a full 75-minute concurrent time slot, would you like your program to be entered into consideration as a Session Snapshot? Session snapshots will allow presenters the opportunity to give a brief, 10 minute overview of an innovative program or practice at their institution. The entire session snapshot block is 90 minutes long and the accepted session snapshot presenters will rotate, each presenting for 10 minutes. The session snapshots are designed to highlight an innovative program or practice and provide participants with key takeaways which they can apply to their own campuses. We are seeking session snapshots which describe an innovate program or practice related to BIT/Care Teams, case management, threat assessment, mental health, or interventions and support. * 13. Please provide a detailed description of the presentation, including at least 3 research citations. * 14. Please list 3-6 intended learning objectives for this presentation. Learning objectives are statements that clearly describe what the attendee will know or be able to do as a result of having attended the program. Learning objectives must be measurable and observable action verbs. Verbs to consider include: list, describe, explain, assess, critique, demonstrate, discuss, apply, utilize, summarize. Thank you for taking the time to complete the Call for Programs for the 11th Annual NaBITA Conference.